OK guys, here's the next batch of the 31 Day Nail Art Challenge! Getting slightly trickier now, but you mustn't give up, the results (and compliments!) are well worth it! Though fairly difficult to tell, I aimed to do a sort of tartan pattern here using a metallic blue, pink and silver. It sort of turned into a mass of blobs, but still looks quite striking we think! What you'll need: a metallic base coat, and then two metallic nail art pens. After the base coat has dried, paint on crosses with one of your nail art pens. Then (and this is where we went wrong!) once it is BONE DRY, take the other pen and draw crosses over the top of these, making these crosses slightly thinner. Tartan-tastic! Ridiculously easy to do and just gives your nails that extra something! Here we used a dark purple, purple glitter and then silver glitter nail varnishes. For this effect you will need a sponge and then lightly dab each colour on, waiting for the nail varnish to dry in between. This design is so much fun and really bright, perfect for the lovely weather Spring brings! After painting your base coat, grab a few nail art pens in different colours and go wild! Here especially like the over-lapping of the dots, giving it that little somethin' somethin'. We went for a simplified manicure here, which has quite a classy look. But give it a go with clashing colours or more stripes! Go mad! 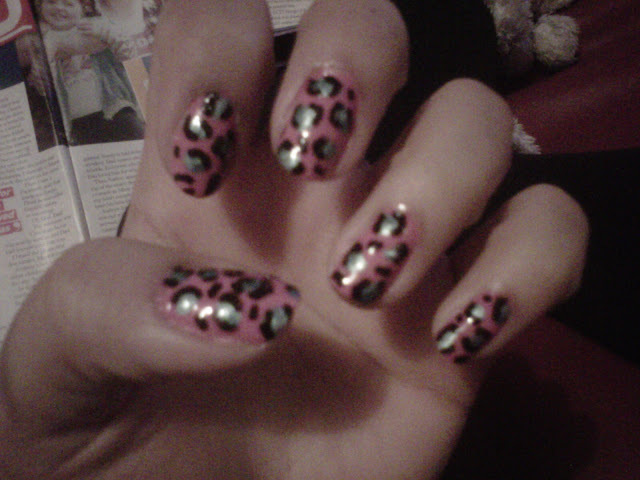 We LOVE LOVE LOVE a bit of leopard print, so it was obvious what animal we wanted on our nails! But just to spice things up, we went for a crazy colour combo. To achieve leopard print: paint on your base coat. Then after it's dry, using one of your chosen colours paint small circular blobs on your nails. Then finally, using your other colour (we recommend a darker one to the blobs) draw semi-circles around the dots and add a few small dots next to these! There's nothing better in life than stopping to smell the roses, and with this design you can have these beautiful flowers at hand any time (get it?) Perfect for the sunny seasons! You will need: a background colour of your choice, a dark green nail pen, a white nail art pen and then two shades of the same colour for your roses. 4) With your dark green, add the leaves to the roses ... and there you have it! This design was so fun to paint on and looks really original and exciting! It's pretty much up to you how you want to paint on your tribal print, we chose three very different colours: purple, red and cream as the base. All you need to do is paint on a few stripes (vertical or horizontal!) anywhere you fancy on your nails, then use a black nail art pen to add the tribal detail. Pretty nifty eh? As you may have guessed, it was St. Patrick's Day when this day came around, so we wanted to incorporate the Emerald Isle into the design! What you'll need: three different shades of green nail varnish and a glitter polish. How to do it: start by painting a stripe of green over the top of your nail; once dry, paint small light green crosses on your nail; once these are completely dry, use your darker green polish to draw an outline of the clovers and the stalks! This design has always seemed quite plain and, well boring, but after trying it out we loved it! Very simple (and easy!) but very effective for a more interesting mani! All you need is a couple of contrasting colours, and you're good to go! Start by applying the base coat, then once dry use your second colour to paint a semi-circle at the base of your nail and it's that simple! We added an extra line to break the colours up even more.